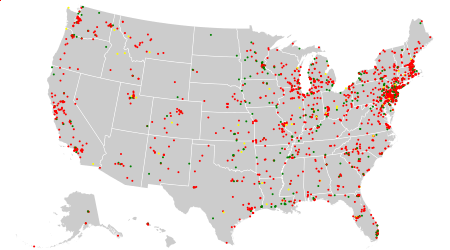 A map of Superfund sites as of October 2013. Red indicates currently on final National Priority List, yellow is proposed, green is deleted (usually meaning having been cleaned up). This is a list of Superfund sites in the United States, designated under the Comprehensive Environmental Response, Compensation, and Liability Act (CERCLA) of 1980. Superfund sites are polluted locations requiring a long-term response to clean up hazardous material contaminations. CERCLA authorized the United States Environmental Protection Agency (EPA) to create a list of such locations, which are placed on the National Priorities List (NPL). The NPL guides the EPA in "determining which sites warrant further investigation" for environmental remediation. As of February 27, 2014[update], there were 1322 Superfund sites on the National Priorities List in the United States. Fifty-three additional sites have been proposed for entry on the list. As of February 27, 2014[update], 375 sites have been cleaned up and removed from the list. ^ "CERCLA". Legal Information Institute, Cornell Law School. Retrieved 15 May 2013. ^ a b c d "National Priorities List". United States Enivironmental Protection Agency. Retrieved March 5, 2014. This page was last edited on 20 January 2019, at 04:30 (UTC).